The Bell'O WAVS99163 cabinet makes an ideal home for a large, multiple-component home theater system. 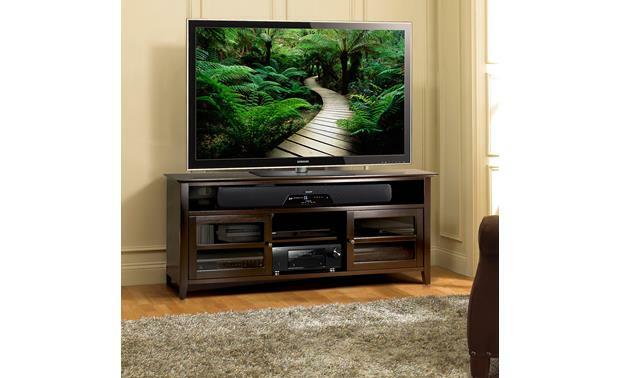 The Bell'O WAVS99163 cabinet makes an ideal home for a large, multiple-component home theater system. 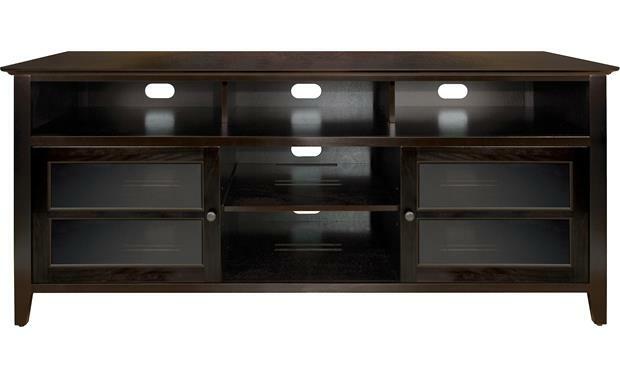 With its dark, rich espresso wood finish and clean, traditional lines, the cabinet complements almost any décor. 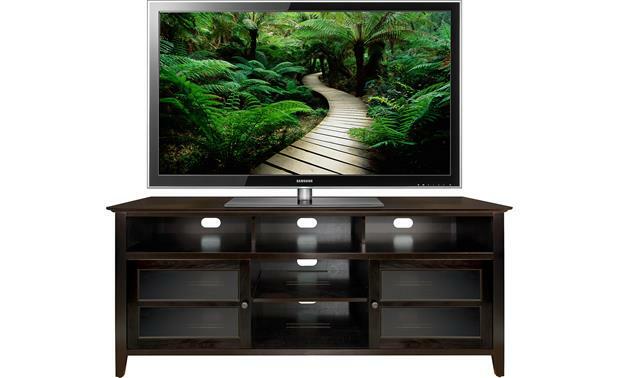 The spacious top shelf can support a TV with a screen size of up to 65" and weighing up to 150 lbs. The large, open compartment provides space for a center channel speaker or sound bar. Or if you prefer, you can store three components in it. Two partial dividers separate the back part of the center compartment, for routing cables neatly. 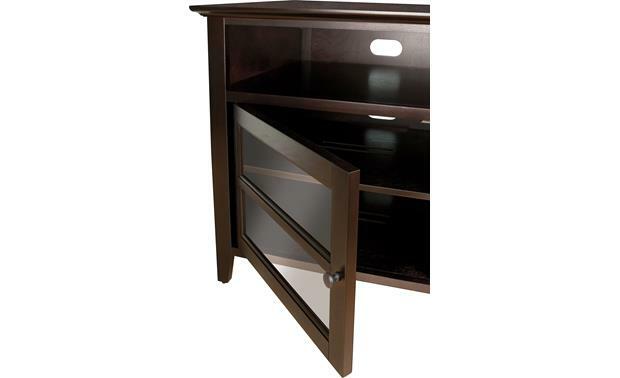 The lower portion of the cabinet features an open central space that can hold two components. On either side are additional shelves behind hinged tempered glass doors. Each side compartment can store two components. 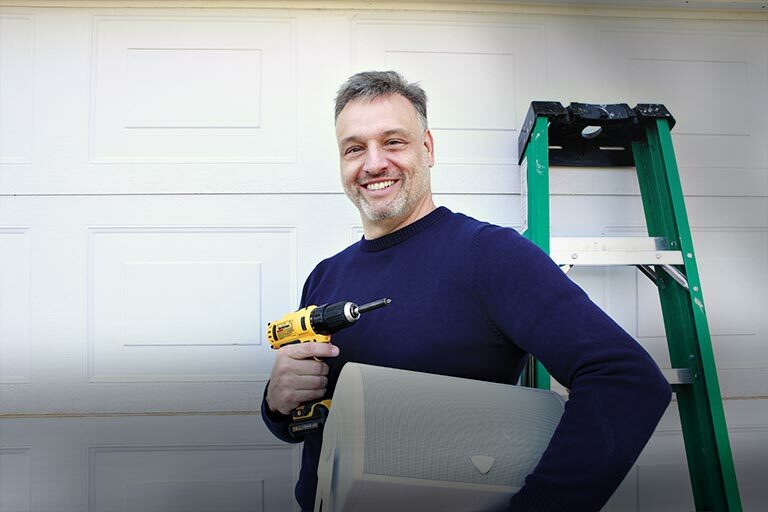 Openings in the cabinet's back panel help keep cables organized and out of sight for an uncluttered appearance. The tempered safety glass door panels show off your system, and allow remote commands to pass through. Bell'O designed the WAVS99163 cabinet to be put together without any tools. The back and side panels are hinged together, so you just have to open them up. The interior shelving and supports slip into place on sturdy pegs. The cabinet doors are already mounted in their frame. 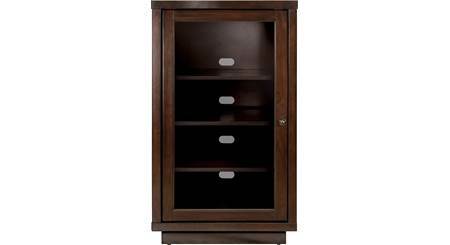 You simply secure the frame to the cabinet with its strong, recessed locks. The product was as expected. I was surprised that the stand was not assembled when I received it. The assembly was straight forward and easy. Took less than 1 hour to put together. The product seems to be well made and should last a very long time. 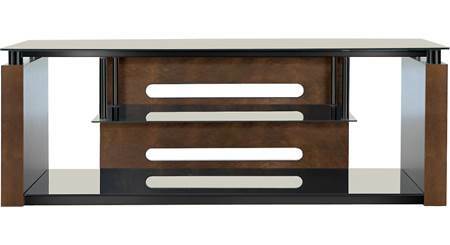 Overview: The Bell'O WaVS99163 is a dark espresso finished wood audio/video cabinet which offers versatility and functionality with a finely crafted elegant design, and assembles in minutes with absolutely No Tools required. 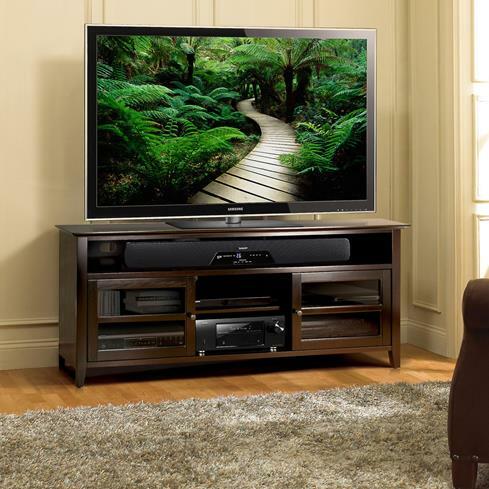 It can accommodate most TVs up to 65" or 150 lbs., and with the removable and height adjustable lower shelves, it can also support up to nine audio/video components. An integrated Cable Management System hides and routes wires and interconnect cables while internal slots provide proper air circulation for convection cooling of your components. Construction: The Bell'O WAVS99163 features solid, quality real wood construction in a beautiful dark espresso finish. The dual doors feature tempered safety glass. 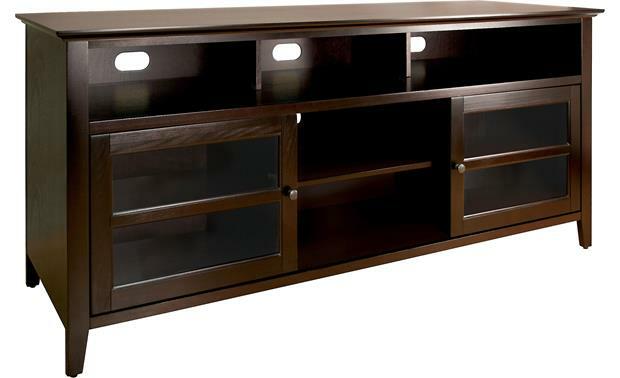 Shelving: The Bell'O WAVS99163 features a top TV shelf, center channel shelf, four component shelves behind dual doors, and two open component shelves. 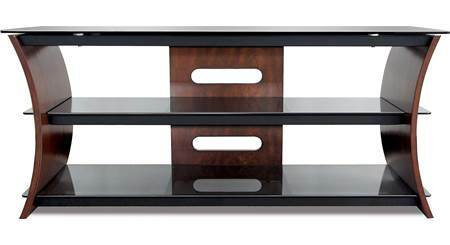 TV Shelf: The top shelf measures 63 (w) x 20" (d), and places your television 28" off the floor. 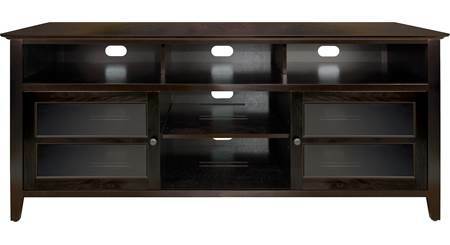 The top shelf can support flat-panel TVs up to 65" or 150 lbs. Center Channel Shelf: The center channel shelf measures 8.25" (w) x 5.875" (h) x 18.4375" (d), and supports up to 35 lbs. Wider soundbars and center channel speakers are limited to approximately 4.25" of depth, due to the top shelf supports. Open Component Shelves: The two open component shelves measure 18.4375" (w) x 19" (d), and support up to 35 lbs each. The bottom shelf is fixed, while the middle shelf is adjustable to 3 positions. In the center position the compartment height of the middle shelf is 7.125", while the height of the bottom shelf is 7.4375". You can adjust the middle shelf up or down 2". 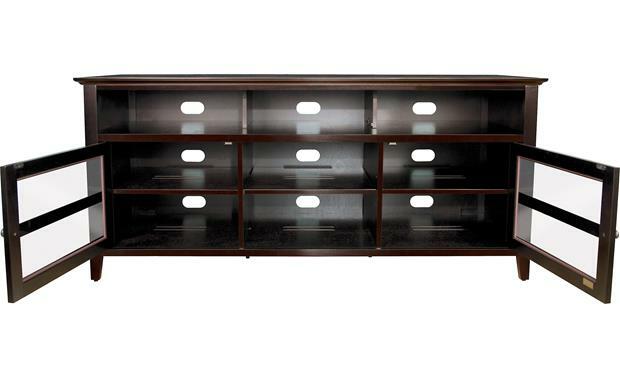 Enclosed Component Shelves: There are two adjustable middle shelves and to fixed bottom shelves behind dual doors. Each shelf measures 17.75" (w) x 19" (d), and support up to 35 lbs each. The middle shelves are adjustable to three positions. In the center position the compartment height of the middle shelves is 7.125", while the height of the bottom shelves is 7.4375". You can adjust the middle shelves up or down 2". Cable Management System: The WAVS99163 features a Cable Management System (CMS) which hides your speaker wires and interconnect cables for a neat and organized installation of your television and audio/video components. Curved wood audio/video stand for TVs up to 60"
Searches related to the Bell'O WAVS99163 Audio/video cabinet for TVs up to 65", no-tools-required assembly.